Holes aren't usually presented as a positive attribute in listings, yet without one, Blue Hole Bay, a 180-acre Bahamanian property listed for $24 million, would be just like any other stunning white-sand beach available for private ownership. In this "remotest part of the Bahamas," as Bob Simon of "60 Minutes" described it in a segment Sunday night, "you'll have trouble finding it on any tourist map today." He continued: "The jet set doesn't come here, because jet planes don't fly here from America or Europe. There are hardly any hotels, no golf courses, no frozen margaritas." So what's the draw, then, for this particular secluded slice of land? 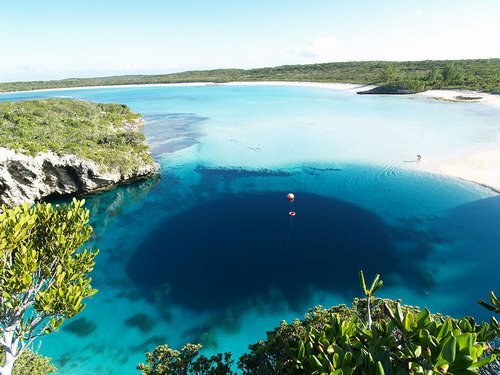 Eager extreme divers flock to the 663-foot-deep Dean's Blue Hole, the deepest saltwater hole in the world and therefore the world's "mecca of free diving," to test out their ambitious, body-contorting breathing exercises: a diver on last night's show descended to a record-breaking 410 feet using only one fin. For lazier beach bums with some pocket change to spare, buying Blue Hole Bay, described in the brokerbabble as "one of, if not the, definitive trophy parcels of the Caribbean," might mean enjoying a "luxurious swim in the clear shallow water of the adjacent turquoise bay perfectly framed by a sparkling white sand beach" or dreaming up "a large resort or development of ultra exclusive private homes." Might be kind of hard to relax, though, with all the near-death experiences taking place in the backyard.